Barker was first listed in the 1847 NYC Directory at 349 1/2 Broadway. The business remained on or near Broadway for almost 50 years utilizing many different addresses. In 1851 they were located at 459 Broadway and by 1857-58 they had moved to 565 Broadway. In the 1859-60 directory their address was listed as 622 Broadway where they remained through 1871. The 1867-68 NYC Directory included an expanded listing for the business. In 1870 they opened a second location at 1275 Broadway. The opening of this location was announced in the June 22, 1870 edition of the New York Herald. They maintained both addresses for just a year or so, dropping 622 Broadway in the 1871-72 Directory. In 1876-77 they moved again, this time to a location four doors off Broadway at 36 West 29th Street. After leaving Broadway they were located at 112 Fulton Street (1895 to 1903); 106 6th Avenue (1903 to approx. 1930) and 1826 Park Avenue (approx. 1930 to the mid-1940’s). By 1948 they had moved to 160 East 127th Street where they remained listed through 1953. They were no longer listed in 1957. The business was run by William Jay Barker until his death sometime prior to 1894 after which it appears that the business remained in the family. NYC Copartnership and Corporation Directories between 1901 and 1919 listed the business as “William Jay Barker (Mary Barker Fareira, only)” and a February 7, 1918 New York Times article, named his son, also William Jay Barker, as president of the company until his tragic death, at the time of the article, in a Connecticut house fire. Management of the company after Mary Fareira’s death sometime in the 1920’s is not clear. 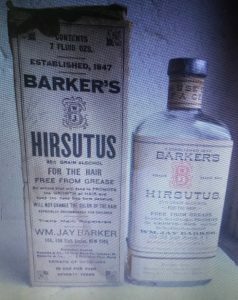 Company advertisements stated that their hair tonic “Hirsutus” dated back to the start of the business in 1847, however the first mention of it that I can find was in an April 12, 1869 advertisement in the New York Herald. Thousands of persons are today scratching their heads and saying they would give anything in the world if they could only get some kind of a remedy that would relieve or cure them of dandruff and other scalp diseases, a large number not knowing of a wonderful remedy which has been in existence over half a century, called Barker’s Hirsutus, which is a positive and well known cure used by the most fashionable people of the world, and if they would use it would never be troubled by these diseases. Hirsutus is a vegetable preparation, free from grease and poisonous chemicals. Positively cures dandruff, failing hair and all scalp diseases. Grows hair on any bald head if directions are faithfully carried out. Hisutus is indispensable to ladies and children. By its use they can keep the scalp free from scruff and dandruff, thereby creating a healthy condition of the scalp , and promoting a soft, pliant and luxurious growth of hair. This preparation costs more than most other remedies of this nature, but IT DOES MORE. Anyone troubled with scalp diseases, takes no chances in using HIRSUTUS. It positively does all that is claimed for it. 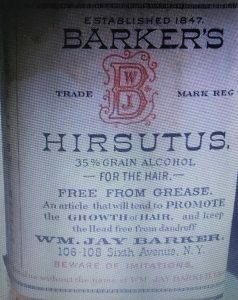 It’s not clear how long the Hirsutus hair tonic was actually on the market. NYC phone books included the word “Hirsutus” with company listings right up through the 1950’s but I don’t see it advertised or included in drug store listings after 1936. As far as I can tell, none of the buildings occupied by the business still exist today. The bottle I found is mouth blown (maybe 8 to 10 oz) with a tooled finish. It’s sun-purpled indicating the presence of manganese dioxide which was predominantly used as a decolorizing agent prior to 1920. It’s shape and embossing are similar to a labeled example recently advertised on e-bay that exhibits the 6th Avenue address utilized by the company between 1903 and 1930. The AR stands for Arthur Winarick, the first of three generations of Winaricks associated with the cosmetics industry. A feature on his grandson, Tom Winarick, in the July 16, 2016 issue of Beauty Store Business Magazine tells Arthur’s story. Arthur Winarick was a Russian immigrant who settled on the Lower East Side of Manhattan and became a barber who would go on to create one of the most iconic beauty products in America – Jeris Hair Tonic. Known for its neon green-formula, Jeris was formulated in the bathtub of Arthur Winarick’s apartment. He began selling it to local barbers within the Russian and Jewish communities, and eventually produced hair tonic and shaving lotions when he founded A R Winarick, Inc. Jeris is still produced today under Clubman. After World War II, (Arthur’s son) Jules Winarick became heavily involved in A R Winarick, Inc. and began expanding and acquiring several beauty brands. Census records and NYC directories both support and add to the above story. According to 1930 census records, Arthur Winarick was born in Poland to Russian parents in 1890 and immigrated to the United States in 1911. The first listing I can find for him was in the 1917 NYC Directory as a perfumer located at 1 Willett Street. Then in the early to mid-1920’s he was listed at 19 Cannon Street with the occupation “barber supplies.” Both Willet Street and Cannon Street were located south of Delancey Street on the Lower East Side of Manhattan. It looks like he established AR Winarick, Inc., sometime around 1930. The 1933 NYC Directory listed them as a New York Corporation with capital of $1,000,000. Arthur Winarick was named both president and treasurer, Joseph A. Gallagher, vice president and Nathan Winarick secretary. Nathan was most likely Arthur’s brother. Four years younger, he was also born to Russian parents and immigrated to the United States in 1914. The corporate address was listed as 797 E 140th Street in the Port Morris section of the Bronx. After World War II it appears that Arthur’s son Jules was named president and Arthur became chairman of the board. According to Arthur Winarick’s obituary, printed in the November 22, 1964 issue of the New York Times, he was still chairman at the time of his death. By then the New York office had moved to Park Avenue South and the company had opened another office in Los Angeles. They also had plants in Brunswick and Newark, New Jersey and Long Island City, Queens. Sometime in the mid 1970’s, the New York office relocated to New Jersey. 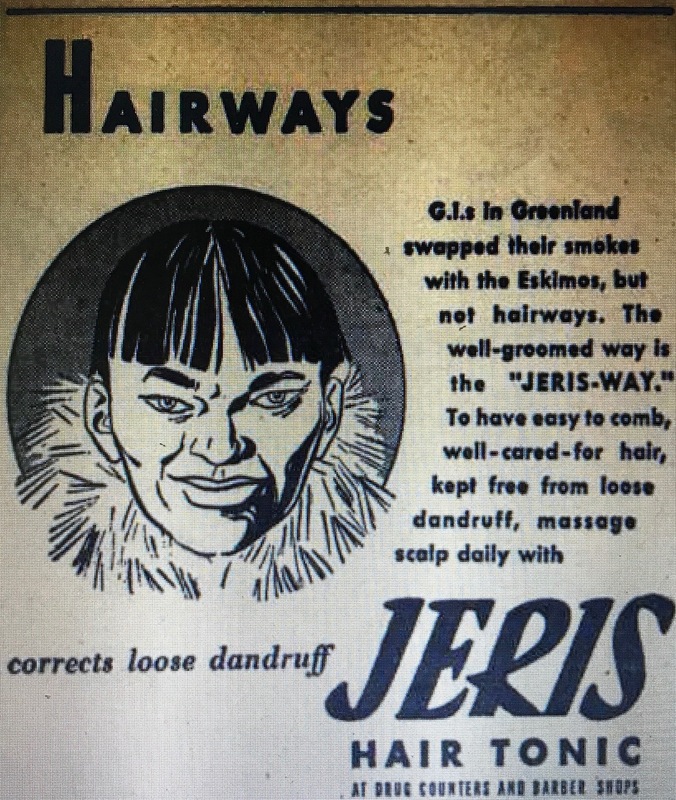 The trademark for Jeris, their signature product, was registered May 29, 1923 (Registration 0168573, Serial No 71167153). Registration information stated that it was first used on September 15, 1921. 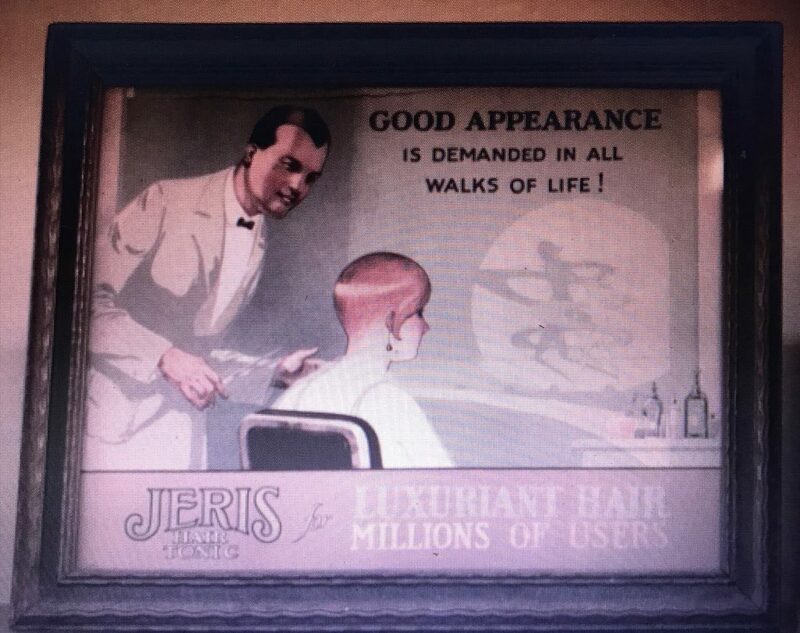 I didn’t find many Jeris advertisements from the 1920’s and those that I did find were store related items like signs and mirrors. Interestingly, of the few early advertisements I’ve seen, several, including the one below, were focused on women. At some point it looks like Jeris became exclusively a men’s product. An early 1950’s advertisement spells out the merits of the green colored hair tonic and leaves no doubt that their target audience was now male. Especially formulated for men who dislike greasy, oil dressings. 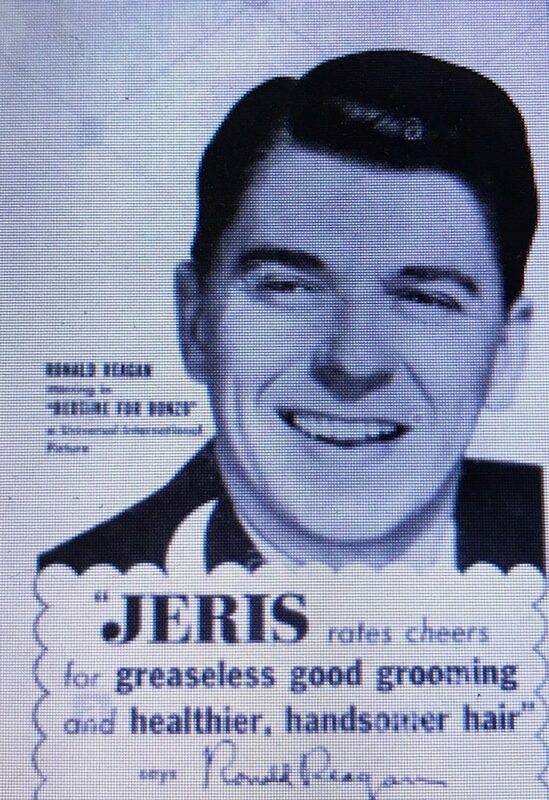 Jeris is recommended by 9 out of 10 barbers; is America’s largest selling, greaseless, antiseptic hair tonic. Jeris never leaves hair with a plastered-down look: never stains hat bands, linen or furniture. Jeris and massage stimulate the scalp, help improve circulation, kill dandruff germs on contact. Women admire its clean crisp, masculine fragrance. Another advertisement I found appealed directly to the G.I. returning from World War II. Other stars participating in this campaign included Kirk Douglas (Ace in the Hole), Fred McMurray (Come Share My Love), John Garfield (Force of Evil) and Ray Milland (Circle of Danger). Today Jeris can still be purchased from Pinaud Clubman. It’s still has its green color and the marketing message remains the same. The bottle I found is machine made. 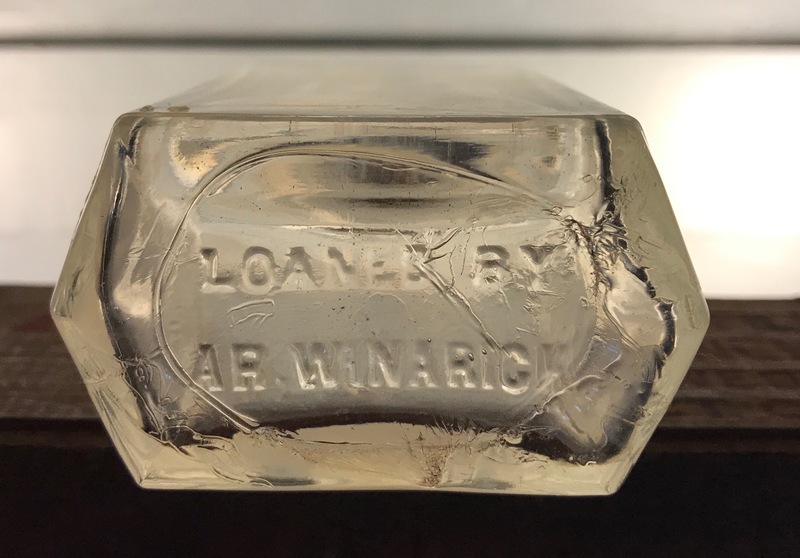 The sides are not embossed but embossing on the base states “Loaned By AR Winarick.” The spout on the bottle was still attached. Printed on the spout is AR Winarick, N.Y. It most likely dates to the earlier period of the business, probably the mid to late 1920’s, before they incorporated. On a final note, Arthur and Jules Winarick were also intimately connected with the Concord Hotel in New York’s Catskill Mountains. According to Arthur Winnarick’s New York Times obituary he founded the Concord Hotel. In the early nineteen thirties Mr Winarick visited the Catskills. He decided to become a host there and he acquired the Kiamesha Ideal Hotel, changed its name to the Concord and guided its growth and development. The hotel, of which his son-in-law, Raymond Parker, is managing director, has a coliseum size nightclub, and a swimming pool, rink and other facilities on a mammoth scale. Mr. Winarick enjoyed mingling with his guests. His remarkable memory permitted him to greet a surprising number by name. According to Jules Winarick’s obituary, he was also involved with the Concord. He also dedicated part of his life to the development and growth of the Concord Resort Hotel in the Catskills. Under his guidance, the hotel went from being a summer getaway destination to a year round resort, which featured one of the largest nightclubs at the time and drew the most famous entertainers of the day. 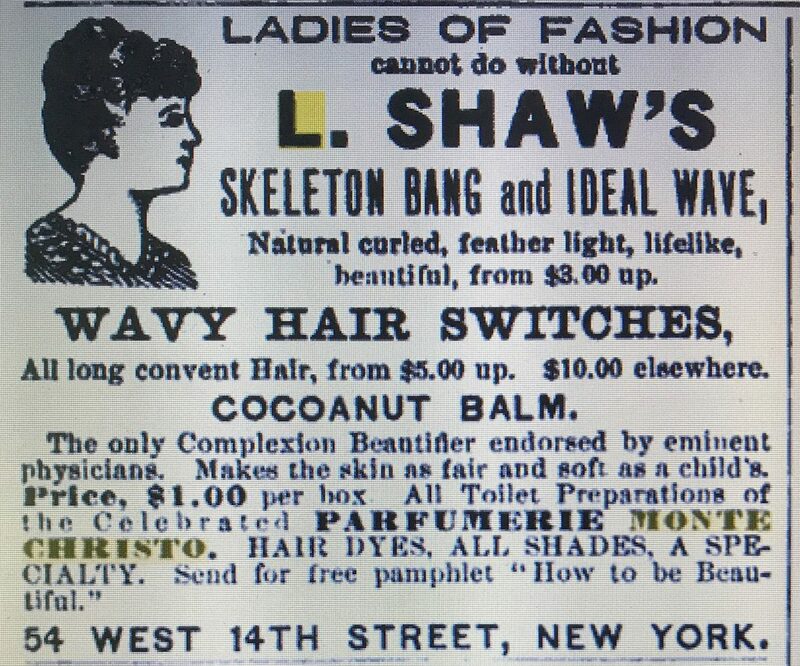 It appears Parfumerie Monte Christo is actually a line of toilet articles associated with L Shaw’s Hair Emporium and later with the Monte Christo Cosmetic Co., both located in New York City. Around 1873, the business address moved to Sixth Avenue in Greenwich Village and then in about 1876, they relocated to 54 West 14th Street which served as their retail location through the early 1900’s. The business was the predecessor of what we would call today the beauty parlor or spa. In his 1899 interview, Edelstein described the range of services provided at this location. These four stories and the basement are devoted to all the details pertaining to the hair, hairdressing, dyeing, shampooing, scalp treatment, manicuring, facial steaming and care of the complexion. As advertised it is the largest hair store in the world. In the interview he stated that they were also the leading wholesaler. …while in another part of town we occupy another entire building for our wholesale trade, being also the leading wholesaler. We import our hair direct, and in fact are the only house doing so, and probably supply more hair goods to retailers than all other wholesalers together. The firm’s clientele and primary target of their advertising was the wealthy woman. Edelstein stated that they began to advertise about 15 years prior (1884) and primarily used daily papers and the theatre programs. At the time there were eight New York newspapers and he preferred the morning papers to the afternoon ones. His reasoning leaves no doubt about who his target audience was. The business marketed a wide range of hair and cosmetics items including several under the name Parfumerie Monte Christo. Sounding French it was probably named this way for appeal to the wealthy woman and her preference at the time for French toiletries and perfumes. 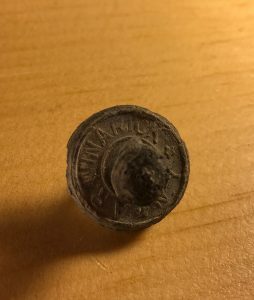 It’s not clear when they started using the Monte Christo name but items with this tag were being mentioned in advertisements as early as the mid-1880’s when the business started advertising. One from 1886, advertised “a complete assortment of beautifying cosmetics by the Perfumerie Monte Christo. The business changed hands around the turn of the century. The 1901 Copartnership and Corporation Directory lists the business for the first time as the Firm of L Shaw, with Gerson Hyman and Manuel Oppemheim listed as the principals. Around 1905 the business moved from their longtime 14th Street location to 506 Fifth Avenue. Hyman and Oppenheim remained listed as principals through 1909. The directories also listed Albert Edelstein, the business manager, at the L Shaw business location through 1909. In 1910, ownership changed again and it appears that the Parfumerie Monte Christo piece of the business was split off. In the 1910 Copartnership and Corporation Directory the principals in the firm of L Shaw are listed as Leo B. and Felix A. Simonson. In the same directory, listed for the first time is a firm called the Monte Christo Cosmetic Co., located at 13 East 30th Street with Albert Edelstein as the only listed principal. The Monte Christo Cosmetic Company continued to be listed through at least the 1925 NYC Directory. After that, I lose track, but Edelstein still lists himself as a proprietor in the cosmetics industry in the 1930 census records. The firm of L Shaw vanished from the directories around 1920. A sample of the product was analyzed by the Bureau of Chemistry and the chemists reported the following results: ethyl alcohol 18.5%; wood alcohol 42.0% and quinin 38 grams per 100cc. 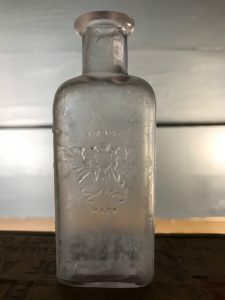 The preparation was declared adulterated in that its purity and strength were inferior to the professional standard under which it was sold, in that wood alcohol had been substituted for part of the rum. It was declared misbranded because the label was false and misleading and likely to deceive the purchaser into the belief that the product was composed of rum and quinin, when as a matter of fact it was composed of rum, quinin and wood alcohol. Interestingly, there was no mention of the product’s false and unsubstantiated claims but only its mis-labeled contents. Containing mostly alcohol, were you supposed to drink it or massage it on your scalp? 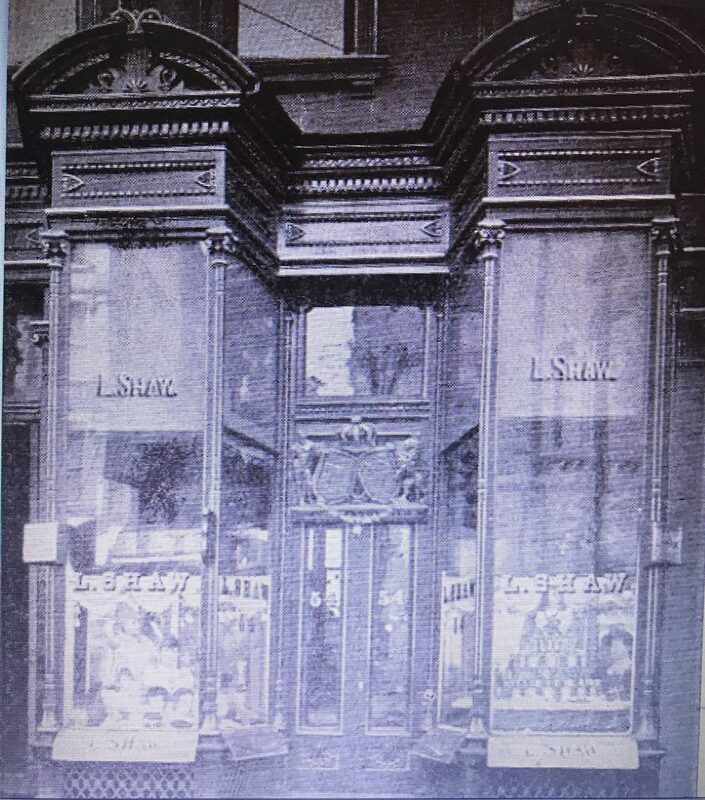 The current building at 54 West 14th Street does not date back to the late 1800’s and therefore is not the building that housed the Shaw retail operation. It’s not clear where the wholesale operation mentioned in the 1899 interview was located. 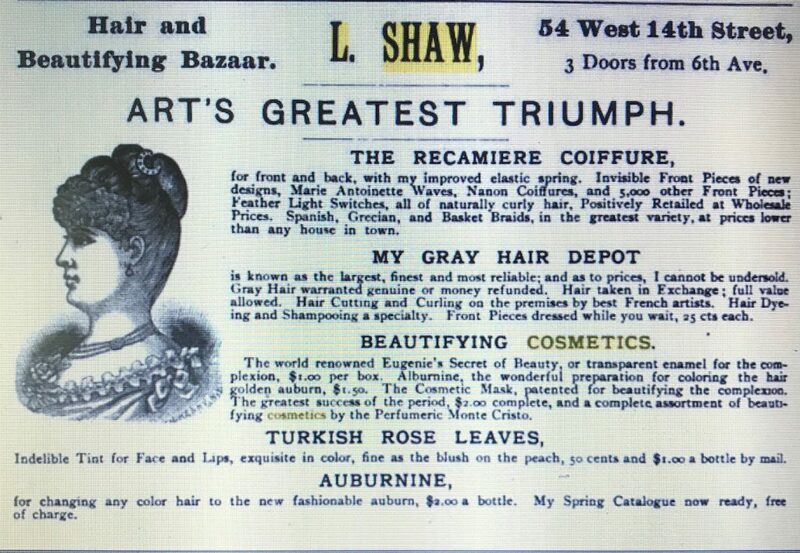 It may be understood at once that so far as hair, switches, curls, bangs, or wigs go, any aids to the skin and hair, hands and eyes, in washes or unguents, America offers none of such value as those prepared by L. Shaw, the world-renowned alchemist and coiffeur, at 54 west Fourteenth Street, New York. Nor in fact, is there in Europe just such as house as this from which all our beautiful women procure toilet articles. Lovely actresses, as well as rulers in the social world, preserve their charms with cocoa-milk, mama dura, and the superfine Monte Christo rouge. Maybe it was some sort of facial lotion? I’ve seen bottles embossed “Monte Christo Parfumerie” on the internet with L Shaw printed on a paper label that’s wrapped around the neck. The bottle I found includes the slightly elongated neck required for this label. Hay’s Hair Health was a hair product sold from the late 1880’s through the early 1940’s. Advertisements during this period indicated that it was manufactured in the late 1800’s by the London Supply Company of New York and later by the Philo Hay Specialty Company of Newark, New Jersey. The London Supply Company apparently started business in either 1888 or 1889. Newspaper advertisements for the London Supply Company and Hays Hair Health began to appear in January of 1889. The first one I could find was in the January 5, 1889 edition of the New York Sun. Between 1890 and 1900 the London Supply Company was listed in the NYC Copartnership and Corporation Directories at 853 Broadway. The proprietor was Freeman Hiscox. The company was no longer listed in the 1901 edition of the directory. Around this time they apparently transitioned the operation to New Jersey. On July 3, 1900, the Philo-Hay Specialty Co. of Newark New Jersey incorporated with a capital of $210,000. Lawrence Hardham was their first president. Freeman Hiscox, the former proprietor of the London Supply Co., was Secretary and Alice L Ward was Treasurer. Philo-Hay Specialties Co. first appeared in the Newark City Directories in 1902 located at 229 Lafayette with Freeman Hiscox as manager. The transition from the London Supply Company to the Philo-Hay Specialty Company apparently took several years. Although they were no longer listed in New York after 1900, some Hay’s Hair Health advertisements continued to reference the London Supply Co. at the 853 Broadway address up through 1904. Newspaper advertisements referencing the New Jersey company began to appear as early as November 1900. The Philo-Hay Specialty Company remained at 229 Lafayette Street until 1906 when they were listed at 29 Congress. In 1908 their address was 30 Clinton and by 1913 their listed address was Verona Ave, corner of Clifton Ave. The business disappeared from the Newark Directories after 1922. In addition to Hay’s Hair Health, the company manufactured a number of other similar products as well including Skinhealth Treatment, Creme Peau Sante (Violette) and Harfina Soap. Harfina Soap was almost always advertised in conjunction with Hay’s Hair Health. If you will stock and push Hays Hair Health, you will never be troubled with complaints from dissatisfied customers. The demand is always on the increase as our advertising runs continuously year after year in our ever increasing list of the best newspapers throughout the country. 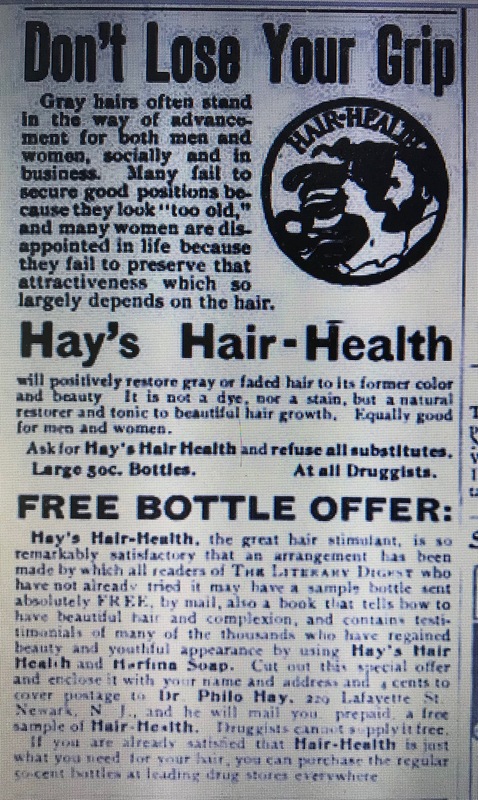 One early advertisement for Hay’s Hair Health printed in the January 5, 1901 edition of “The Literary Digest” delivered a message that is not very different from the one delivered today by the advertisers of both men’s and women’s hair products, though certainly not in the same words. Gray hairs often stand in the way of advancement for both men and women, socially and in business. Many fail to secure good positions because they look “too old” and many women are disappointed in life because they fail to preserve that attractiveness which so largely depends on the hair. Hay’s Hair Health will positively restore gray or faded hair to its former color and beauty. It is not a dye, nor a stain, but a natural restorer and tonic to beautiful hair growth. Equally good for men and women. This hair food acts on the roots, giving them the required nourishment and positively produces luxuriant hair on bald heads. 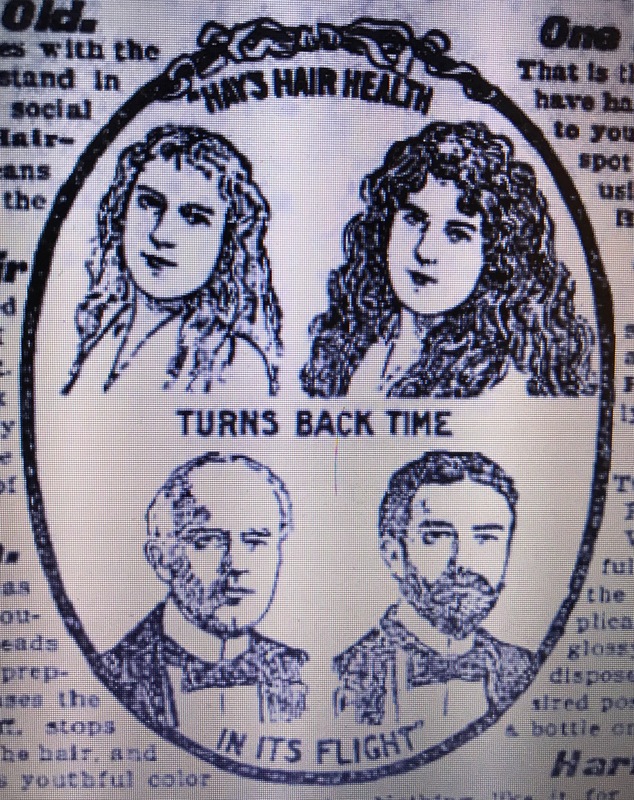 An advertisement published in various forms between 1902 and 1915 used the slogan: “Hay’s Hair Health turns back time in its flight,” and actually included before and after illustrations. The product’s trademark which included the words “Hays Hair Health” with a picture of a woman with flowing hair and a bearded man all within a circle (no. 43022) was published by the U S Patent Office on August 9, 1910 but they were using it well before that. The phrase “Hay’s Hair Health” dates back to their earliest advertisements in 1889 and the picture described in the trademark is shown in the 1901 advertisement above. This is simply one of the glycerine water solutions of lead acetate with considerable free sulphur. The use of any preparation, even externally, containing such a dangerous poison as lead acetate is unsafe. This combination is also sold under the false claim that it is a hair restorer. It is…a mixture of sugar, lead (1.5%), sulphur (1.5%), alcohol and water. The contents of a fifty cent bottle are worth but five. 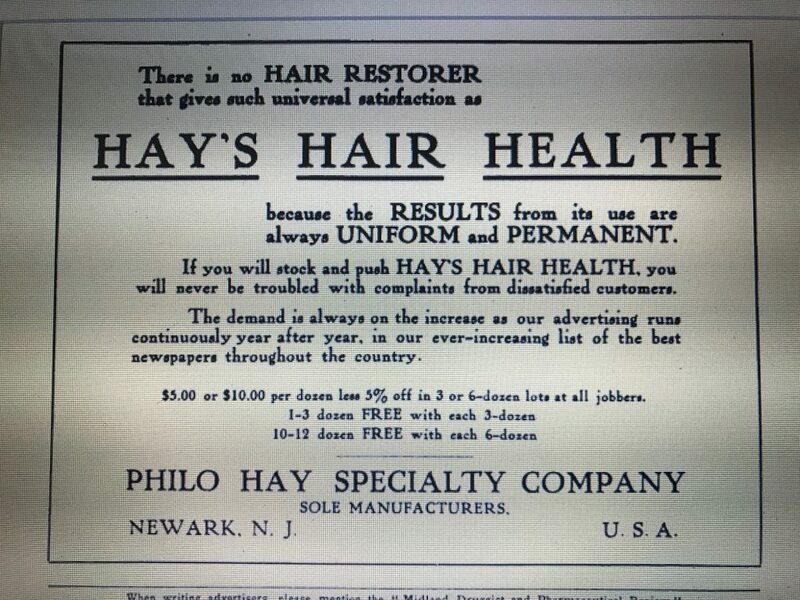 After 1922, when the Philo Hay Specialty Company was no longer listed in the Newark directories, its not clear who manufactured Hay’s Hair Health but it continued to be named in drug store advertisements as late as 1942. This advertisement printed in the May 1, 1940 edition of the Buffalo (NY) Courier still advertised it in conjunction with Harifina Soap. Today, 853 Broadway in NYC is a 21 story building built in 1929 and therefore could not have been used by the business. In Newark the southeast corner of Verona and Clifton is occupied by a 2 story building that appears to have been converted from manufacturing to residential. It could have been used by the business. I found two identical mouth blown brown medicine bottles embossed Hay’s on one side and Hair Health on the other side. They match a labeled bottle included in a 1913 advertisement that included an offer for a free bottle. Piecing together information from the NYC General Directories, the Trow Copartnership and Corporation Directories and the ERA Druggist Directories, this business was active from 1905 well into the 1930’s. 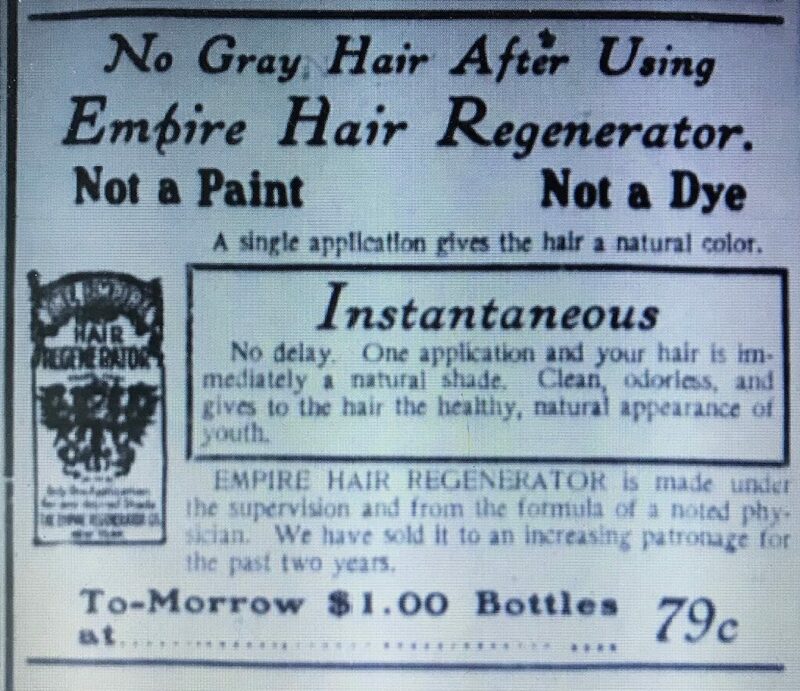 Prior to 1911, I’ve seen the business referred to as both the Empire Hair Regenerator Co (as embossed on the bottle) and simply the Empire Regenerator Co. In 1911 and later, the company was referred to exclusively as the Empire Regenerator Co. The Directories typically associated the business with hair dyes and hair goods. The ERA Directories listed them as manufacturers of toilet preparations. George Gyllstrom was the company president through 1911 and William Munson was the president from 1912 to at least 1920. During this period, Klas Gyllstrom was listed as a Director so it appears the Gyllstrom family remained active in the business. After 1920, the company leadership is unknown. The company’s long time address from 1905 through 1928 was 242 6th Avenue. Located near the intersection of Houston Street and 6th Avenue, I assume they had to move in the early 1930’s when their building was acquired and demolished to accommodate the widening of Houston Street. By 1932 they were listed at 566 6th Avenue and in 1935 they moved again to 605 6th Avenue. 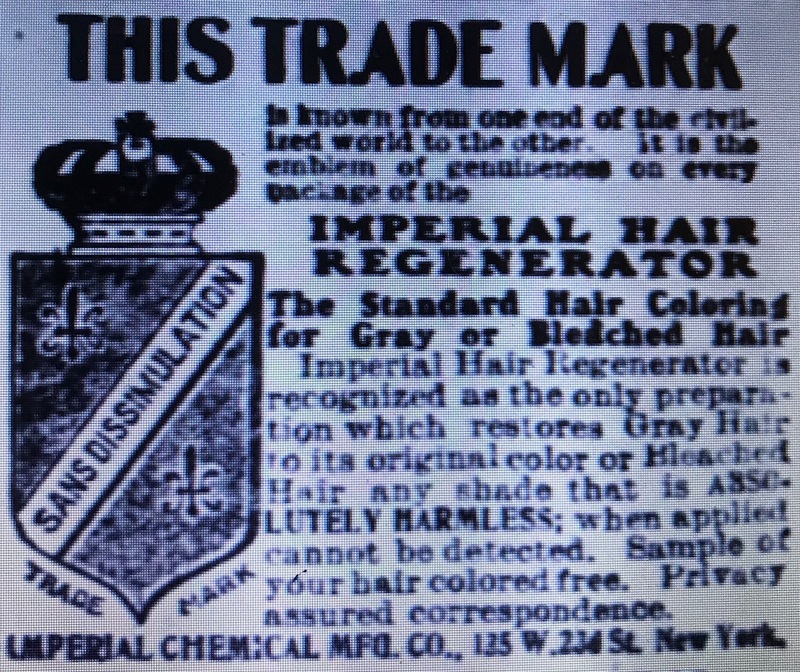 This “Empire Hair Regenerator” advertisement was included in a much larger advertisement for a department store called the “14th Street Store” printed in the May 15, 1907 edition of the “Evening World.” It included the same “eagle” trademark that is embossed on the bottle I found. One application and your hair is immediately a natural shade. Clean, odorless and gives to the hair the healthy, natural appearance of youth. A 1935 advertisement in the August 22 issue of the Brooklyn Daily Eagle exhibited the shortened company name and the 605 6th Avenue address. The Federal Trade Commission announced yesterday a New York City concern and a Buffalo firm have agreed to discontinue alleged “false and misleading” advertising in connection with sale of their products. 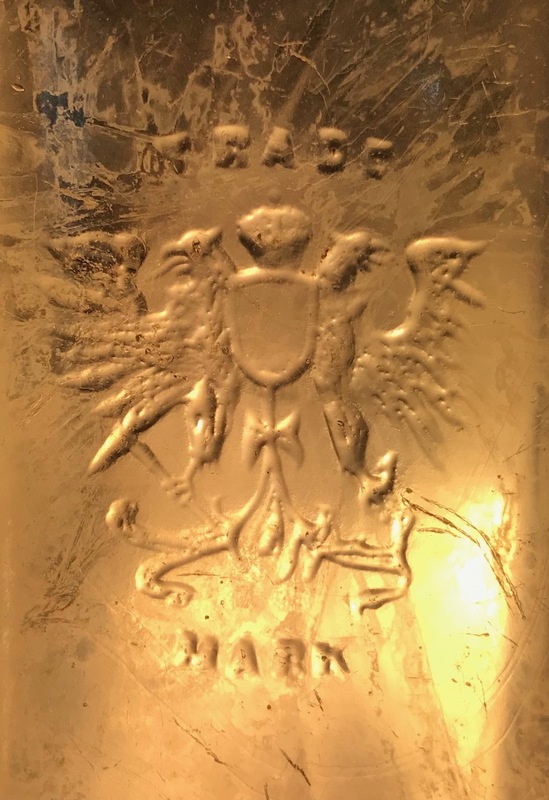 The bottle I found is a small mouth-blown rectangular medicine bottle with their trade mark eagle embossed on the front panel. 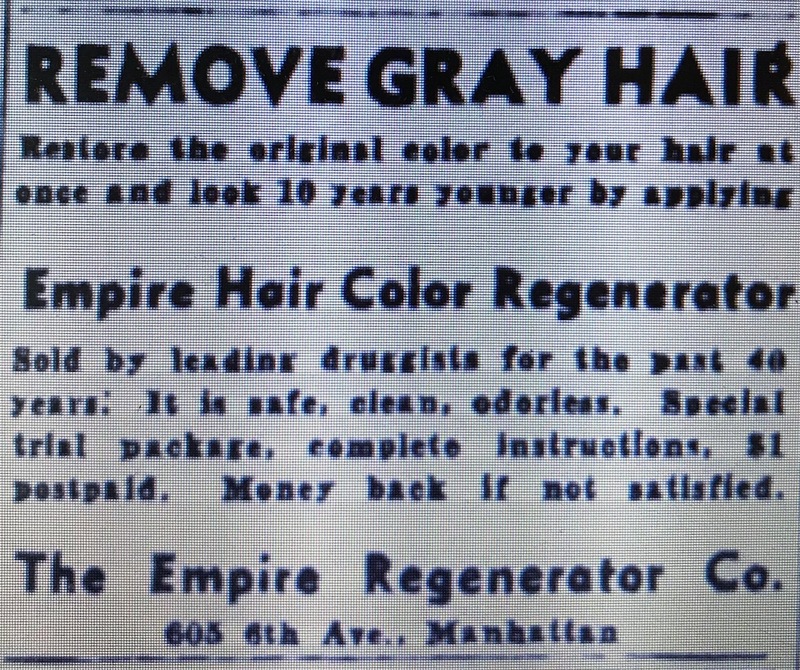 “The Empire Hair Regenerator” is embossed on one side and “New York” on the other side. 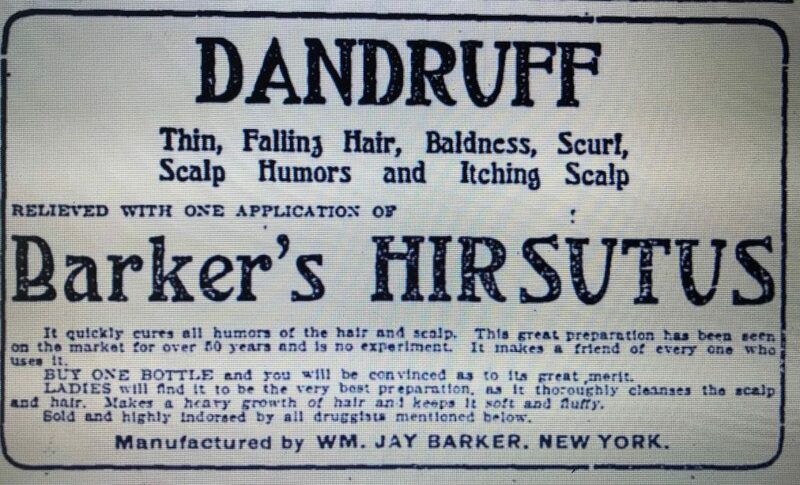 The fact that it’s mouth blown and includes the word “Hair” in the company name leads me to believe it’s probably pre-1912. The Imperial Chemical Manufacturing Company was in business from the mid-1880’s until the early 1930’s. 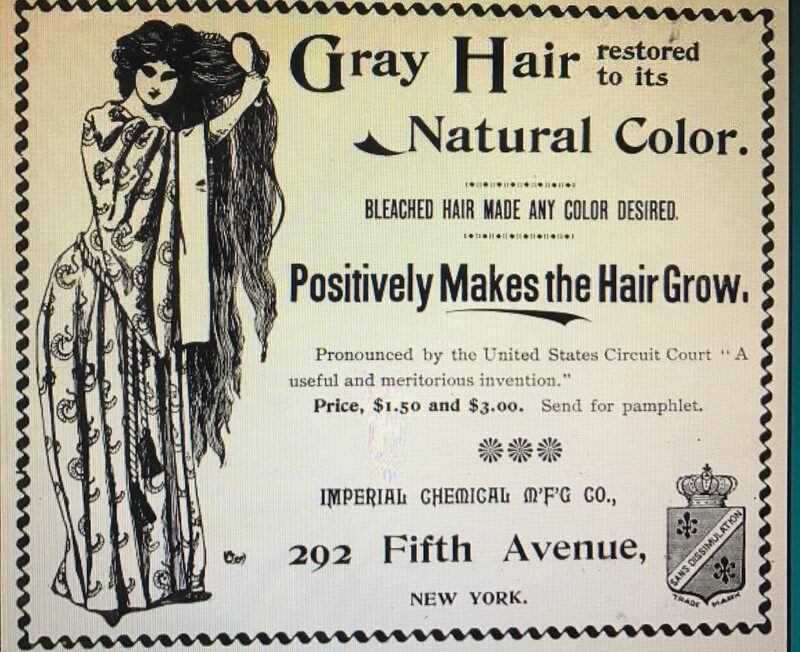 Located in New York City, they manufactured hair products that were advertised and sold across the country. An advertisement from 1915 provided a menu of several products sold under the “Imperial” brand name. Imperial Hair Regenerator – Recognized as the standard hair coloring for gray or bleached hair. Imperial Vigorosis – Is a marvelous hair grower and tonic. Arrests the falling of and stimulates the hair follicles. 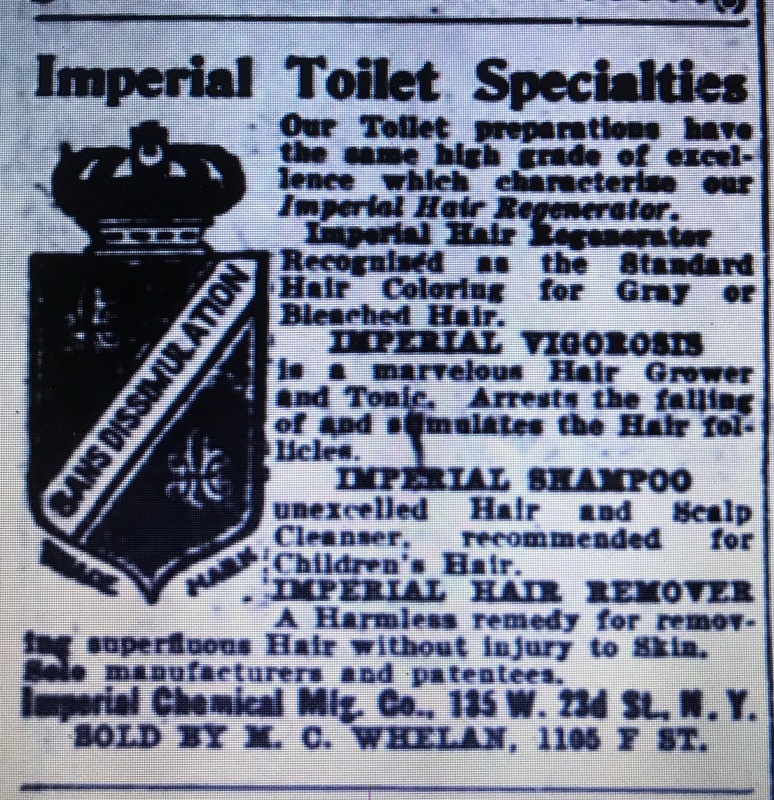 Imperial Shampoo – Unexcelled hair and scalp cleanser, recommended for children’s hair. Imperial Hair Remover – A marvelous remedy for removing superfluous hair without injury to skin. They were incorporated in NewYork in 1901 and possibly earlier. W Gordon Kellogg was consistently associated with the company through the early 1930’s, usually as president. By 1933, the Imperial Chemical Mfg Co was no longer listed. 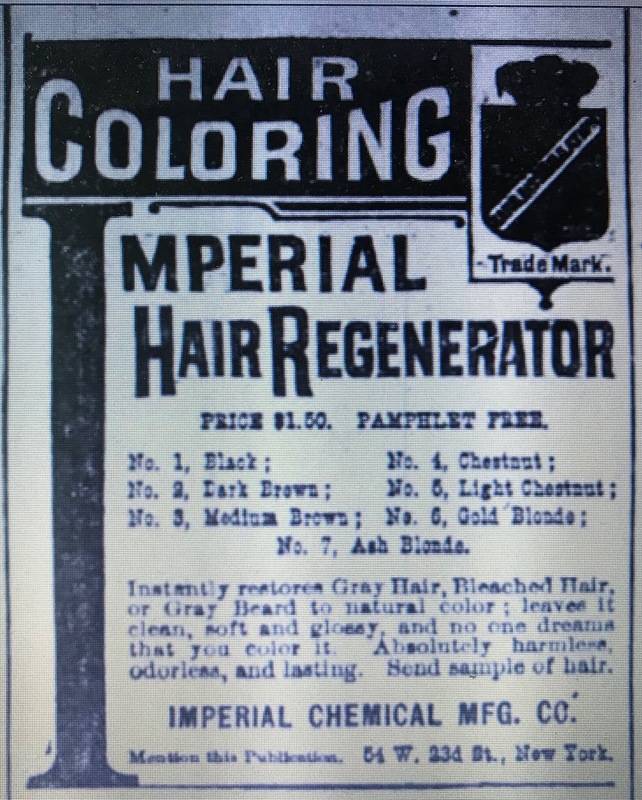 Their signature product was the “Imperial Hair Regenerator,”which they were apparently making right from the start of the business. The earliest newspaper advertisement for it that I can find was in the September 22, 1887 edition of the “Buffalo (NY) Commercial.” It addressed both a male and female audience. Instantly restores Gray Hair, Bleached Hair, or Gray Beard to natural color: leaves it clean, soft and glossy, and no one dreams that you color it. Absolutely harmless, odorless and lasting. The advertisement goes on to list seven standard colors: No. 1 – Black; No. 2 – Dark Brown; No. 3 – Medium Brown; No. 4 – Chestnut; No. 5 – Light Chestnut; No. 6 – Gold Blonde; and No. 7 – Ash Blonde. It positively makes hair grow. One of their advertisements appeared in an 1899 Issue of the “Pariasian Illustrated Review” a publication that touted itself as “keeping it’s readers current with the works of the great French writers.” This leads me to believe that Imperial’s following included the entire spectrum of the population from those interested in French literature to clammers and fisherman making a living on the bay. The bottle I found is a large mouth blown medicine that dates to the late 1800’s to early 1900’s.